Vegan food once had a reputation as being little more than bland beans and steamed spinach. But as more people are giving veganism a try (even the beloved Queen Bey!) and others are simply trying get a health boost from more plant-based eating, plenty of restaurants around town (including The Hollywood Roosevelt’s own Public Kitchen & Bar) are churning out amped-up vegan dishes that even carnivores are loving. Here are five to try right now. A centerpiece for summer gatherings, the vibrant crudite board has become a favorite among veggie-loving vegans – boasting artful displays of sliced vegetables, flavorful dips, and more. 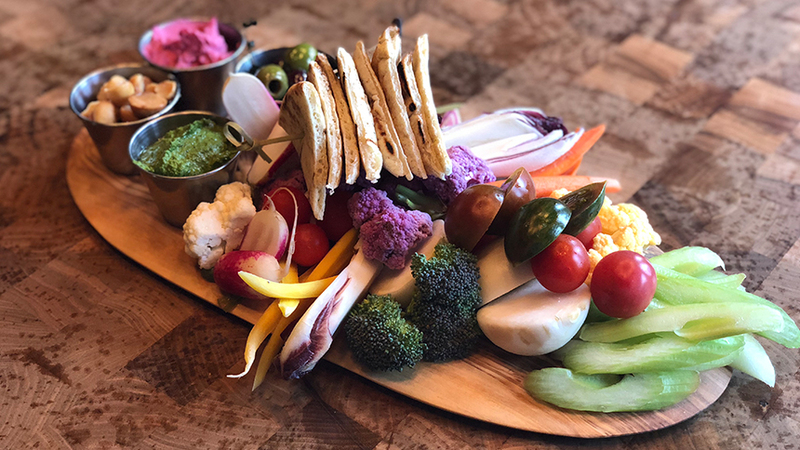 At classic American bistro Public Kitchen just off the lobby of The Hollywood Roosevelt, the kitchen churns out a beautiful Farmers Market Crudite Board with colorful heirloom crudite, beet hummus, mixed olives, and the perfect smattering of Marcona almonds. It may not look like it from the outside, but this neighborhood pub boasts a menu full of casual fare that just happens to be entirely vegan – from the chili to the hot dogs to the Loco Moco bowl. One don’t-miss dish? Beelman’s killer Tachos that swap tater tots for the tortilla chips, topping the fried spuds with house-made soyrizo, cashew cheese, salsa, Gochujang crema, pickled jalapenos, and a smattering of birds-eye chili-seasoned pinto beans. Who says vegans don’t get to indulge in fun bar food? It’s all about bubble-laden, crispy crust with a chewy center that’s made with locally milled flour at this bustling duo of artisanal pizzerias, so we promise, you won’t miss the cheese at all. 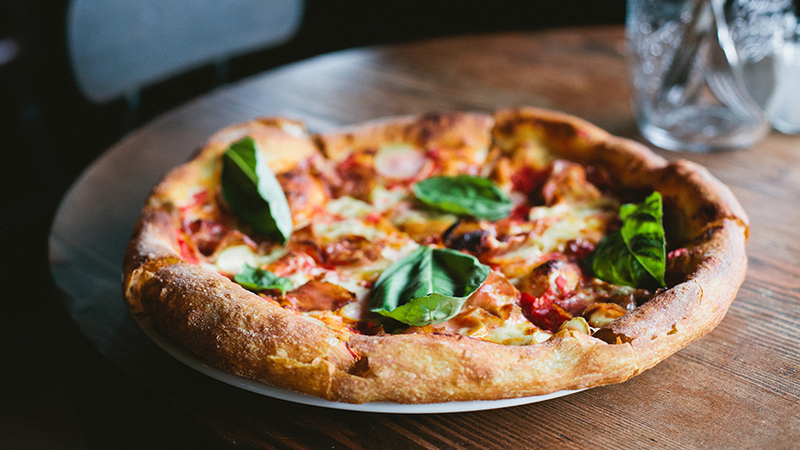 The Rossa uses a house-made tomato jam as a base and then tops the whole thing with fresh basil, peppery wild arugula, and olive oil to give vegans the perfect pizza fix. Newfangled meat substitutes and plant-based cheeses are great and all, but sometimes the most amazing vegan dishes are just simple vegetables prepared perfectly. And Gjelina’s cauliflower dish – that’s been on the menu since the eatery first opened on Venice’s uber-cool Abbot Kinney Boulevard nearly a decade ago – is just that. While it’s got just six ingredients including vinegar, garlic confit, and parsley – and you can find the recipe published in the restaurant’s cookbook – we guarantee it won’t be as good at home as it is fresh out of the restaurant’s wood-burning oven. Bonus: The dish comes laced with colorful versions of the veggie in orange and purple when they’re in season. 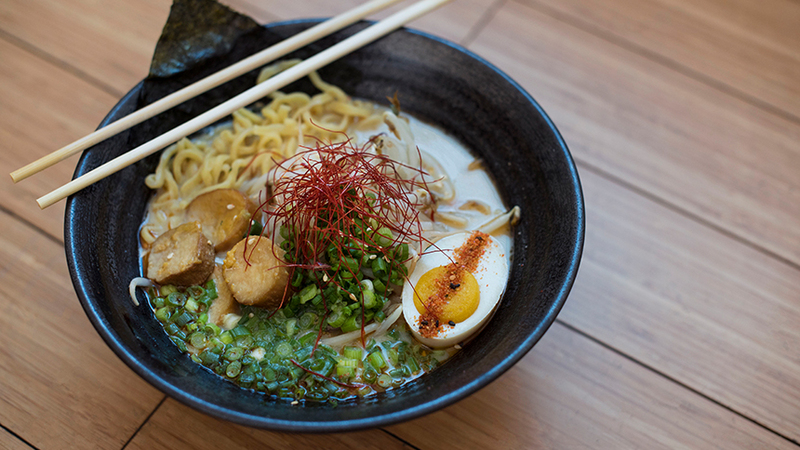 While purists might argue that any ramen not made the traditional way – with a hearty broth long-simmered with animal bones – isn’t actually ramen at all, veg-heads can at least get a shot at slurping the noodle-laden soup at this all-vegan ramen bar tucked inside Downtown’s fabled food hall Grand Central Market. 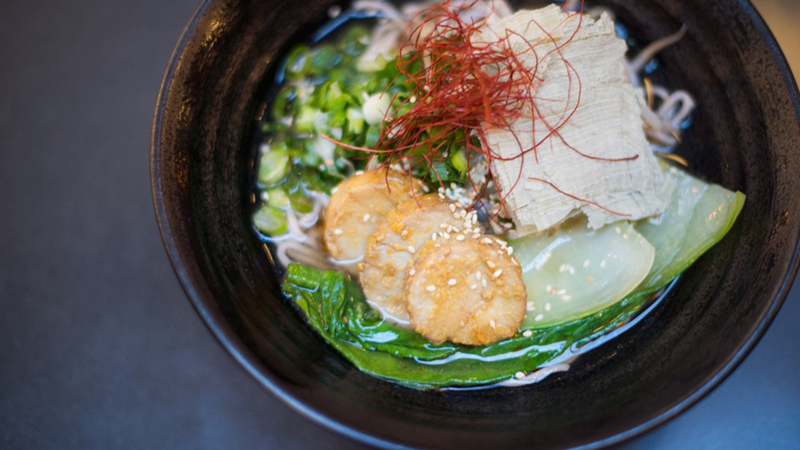 Using a sunflower seed broth (how’s that for something new?) that mimics the richness of a meatier stock, the soup comes full of hearty oyster mushrooms in lieu of pork and a cooked “egg” that’s, in fact, soy-based along with noodles galore, bean sprouts, chili threads, nori, and a squeeze of spicy paste for those who like it hot.